Huang Xiaoming’s triad boss in the Shanghai Bund is so handsome, he can’t resist trying to hit on himself. Too bad the triad boss looks so murderous. With the recent drama Prince of Orchid Hills/Lanling Wang coming to an end, most viewers have already reconciled themselves with Feng Shaofeng’s pretty-boy general. But on that note, which other actors might have made a convincing case for feminine beauty? (Sorry, Jet Li, and Jackie Chan. I can’t look at your female forms without wanting to laugh). 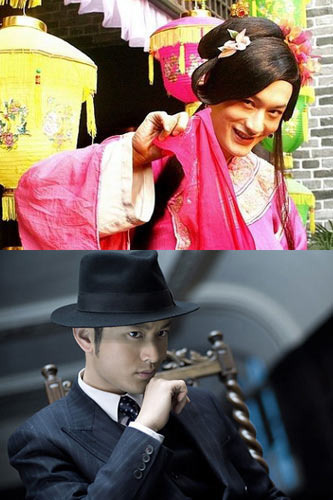 Take a look below to see a selection cross-dressing men in Chinese entertainment. Wallace Huo dresses up as a Victorian lady (and puckers up for a kiss as his wuxia counterpart stares in disbelief). Nicolas Tse sports two braids and what looks like a schoolgirl outfit. Throw in Tony Leung, Du Haitao, Sammul Chan, Li Yugang, and Eason Chan, and it’s a field day – you’ll find a list of contenders to be the fairest of them all.